If you are looking for a value for money machine, then Brother ES2000 probably won’t be a good choice. Its performance does not justify its price. In simplest of words you can define Brother ES2000 as ‘A computerized beginners sewing machine with some nice features’. The design of this sewing machine resembles Brother CS6000i, which is a quality sewing machine on its own. ES2000 comes in the same price category as well. So it is rest assured that those who are looking for a beginners machine will compare it to the mighty CS6000i. Yes, CS6000i is pretty much the benchmark for beginners sewing machines, be it for quality, price or performance. 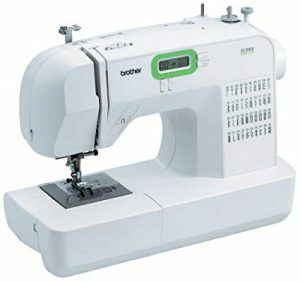 Brother ES2000 has 40 built-in stitches, of which 21 are decorative. 77 stitch functions include utility, mending, quilting, stretch and decorative. There are 5 1-step buttonhole styles on this machine. It is free arm capable. There is an automatic needle threader, which will save you from the eye strain. It comes with top drop-in bobbin system. Brother ES2000 is capable of sewing at a speed of 850 stitches per minute, which means that it has a very good motor inside. The LCD screen is pretty basic and it displays stitches and other adjustments. There is a reverse stitching button as well. Dual LED lights provide lighting, which seems below par for sewing in the dark. The thread tension can be easily adjusted using the dial. If you run into any kind of error, the machine will let you know with the error alarm. The user manual has very detailed information on how to fix them.This machine, like all Brother machines comes with a limited 25 year warranty. Brother ES2000 is a lightweight sewing machine. Even though this is a computerized machine, it still lacks some features like start/stop button. It is a very good beginners machine but it is priced a little bit high for what it can offer. It does a very good job with light fabrics but when it comes to thick materials like denim, the machine seems to struggle a little bit. The machine struggles while sewing over areas where two seems intersect. This issue has been pointed out by many users. Another issue pointed out by users is that the thread seems to slip out of the needle hole unless you have a long thread tail. The LED work lights are not that good. They are very dim to be honest. One more thing, you might run into trouble if you don’t use the recommended thread and presser foot. The automatic needle threader simply won’t work if you use any threads or needles other than the sizes of 75/11-100/16. I am not going totally negative about this machine, Brother ES2000 has all the the stitches you need and you will find it very useful for light fabric sewing. If you want a sewing machine that works equally well on thick and thin fabrics, you will be better of going with Brother CS6000i. Since this model is so often compared with CS6000i, let us have a look at the comparison. To be really honest, I am not that impressed with Brother ES2000. Performance wise, it needs a lot of improvement and the price is not that great either. Brother ES2000 is priced similar to Brother CS6000i. There is no question about the quality of CS6000i, it is far superior than ES2000 and has some additional features. To me, ES2000 doesn’t add any value, especially when you can get an awesome machine in CS6000i, which comes under the same price category. Moreover it comes with a quilting table and hardcover as well.